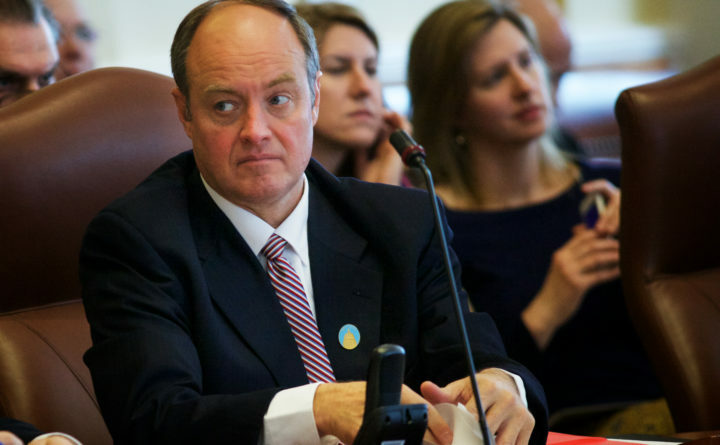 Sen. Andre Cushing, R-Newport, announced Thursday that he won't run for re-election to the Maine Senate. Republican Sen. Andre Cushing of Newport, who faces a legal battle and has paid a large fine for campaign finance violations, announced Thursday he will not seek re-election to his Senate seat. Cushing is eligible for another two years in the Senate under Maine’s term limits law, which limits lawmakers to four concurrent terms, and until events that unfolded since 2016 appeared poised to continue. In October 2016, the Maine Ethics Commission launched an investigation into Cushing’s campaign finance activities after his sister accused him in a civil lawsuit and a complaint to the commission that alleged he misused family business funds and commingled some of it with campaign funds. In August 2017, the commission levied $9,000 in fines against political committee run by Cushing for 11 finance reports that were filed late between 2014 and 2016. The civil lawsuit is still pending. In October 2017, Cushing resigned from his position as assistant Senate majority leader, which was subsequently filled by Sen. Amy Volk, R-Scarborough. Cushing has easily won his elections to the Senate and has been known as a prolific fundraiser for Republican causes. His Respect Maine Political Action Committee, for example, raised more than $380,000 between 2013 and 2016. Cushing’s Senate District 10 seat represents Carmel, Corinna, Corinth, Dixmont, Etna, Exeter, Glenburn, Hampden, Hudson, Kenduskeag, Levant, Newburgh, Newport, Plymouth and Stetson. Cushing is still listed as an active candidate for the seat on the Maine Ethics Commission’s website. No one else has filed the paperwork indicating an interest in running for the seat, though Rep. Stacey Guerin, R-Glenburn, who is in her fourth term in the Maine House, announced in a news release Thursday that she will launch a campaign.